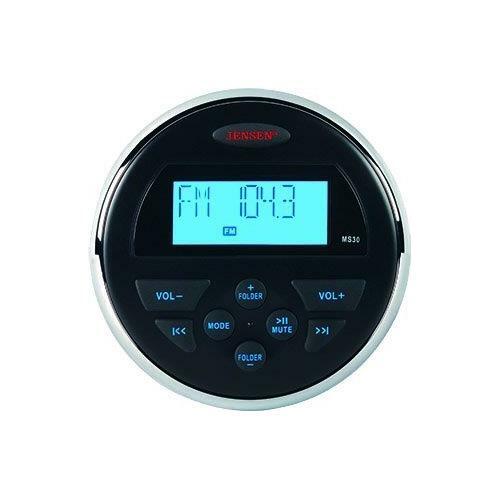 The Jensen MS30BTR Compact Waterproof Bluetooth Stereo receiver will change the way you listen to music on your boat, without any drastic changes or cutting on your vessel. This digital media receiver packs a lot of features into a compact design that fits into a standard tachometer opening. You’ll enjoy AM/FM radio as well as take advantage of the rear USB input or Auxiliary input to enjoy your favorite music files. The unit is equipped with built in Bluetooth for hands free connection of your preferred tunes. The MS30BTR includes four channel outputs so you can expand your system with some speakers or an amplifier. The LED display tells you what your listening to with just a glance, while the watertight IPX6 stable face and controls will stand up to sun, salt and moisture with you’re riding the waves. This feature refers to whether or not the amplifier is able to connect to a hands-free Bluetooth device. Amplifiers that are Bluetooth ready typically require the purchase of an optional adapter or accessory that connects to the rear of the head unit. This optional accessory allows you to accept phone calls through your head unit and speakers. Some head units have built-in Bluetooth hands free capabilities with an included remote-mount microphone or built-in microphone. A port on the amplifier that serves as an input for a USB cable. Different amplifiers have different capabilities, so it's best to check the specific model to see if it will control the device you have in mind.